Paying through the nose, um, or teeth. 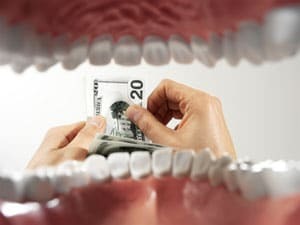 The cost of dental care has been in the news again following the release of the report by the Ipsos Social Research Unit, which showed that around 1.9 million people went without dental care in 2009 because they could not afford it. The early results of the detailed survey of 2,700 Australians also revealed cost as a major reason for about 3.5 million Australians having avoided the dentist for more than four years. Greens senator for Victoria, Dr Richard Di Natale, said the results were consistent with previous research on the issue and were a boost to his party’s campaigning for the establishment of ‘Denticare’, a universal dental insurance scheme. Making dental care a bigger priority for the federal government was a key condition of the agreement struck between the Greens and Labor after the last election, he said. “It was one of the key campaign priorities for us going into the last two elections. Because of this agreement we’ve now got a National Dental Advisory Council (as reported in Bite here) established, and we hope there will be significant investment in [dental health] in the next budget. Without the universal dental scheme, the cost of treatment in comparison with benefits received will continue to have increasing impact. The informed decision-making required to address this problem cannot happen without education on oral health issues. The Colgate promotion on the special needs of diabetics represents a major leap forward and must be commended. An extension of such education potential to include all the risks of oral health linked to systemic health must now be implemented. The Teen Dental Scheme is a worthwhile scheme with a realistic rebate. I would whole heartedly support such a scheme for one year olds so parents can be fully informed before the damage is done (ADA Babies and Toddlers Campaign, http://www.babyteeth.com.au). Why was there only a 30% uptake by consumers? Could it be that insufficient information is provided to the public and practitioners about such an innovative scheme or could it be that dentistry is still such a low priority to the general public that even if there is free care on offer treatment will still only be sought when pain is the issue? Significant amounts are spent annually on gambling, alcohol, entertainment, fashion, cosmetics and hairdressing (to mention just a few) yet regular dental check ups are considered too expensive for low and middle income earners? Is this a money issue or a priorities issue? Despite having the knowledge about prevention individuals continue to take risks with their health, they are willing to take the gamble, so should someone else pick up the bill?